Work has begun on Canalside, the long-awaited multi-million pound transformation of the Sheerwater area of Woking. The major regeneration project will breathe new life into this deprived area, creating a thriving, sustainable community that meets the changing needs of modern living. The number of homes will double from the current 570 to around 1200, almost half of which will be affordable housing. 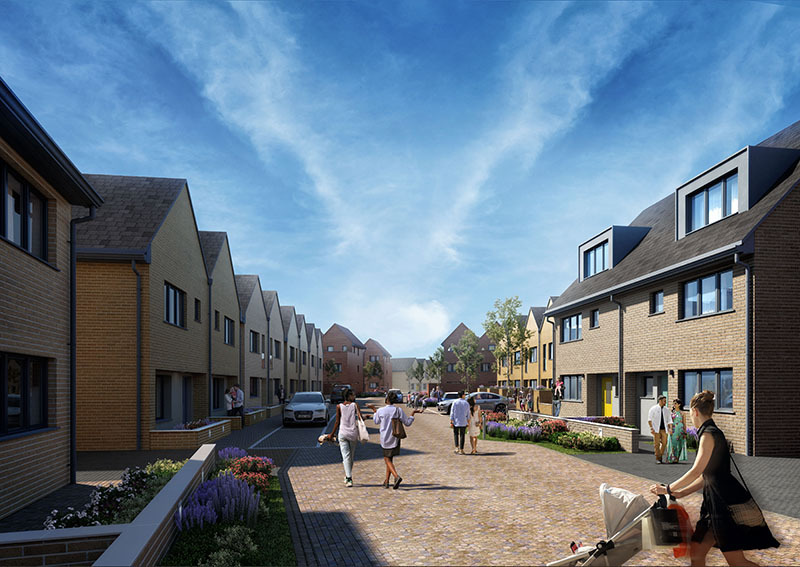 The old 1950s housing stock will be replaced with a variety of high quality new homes for rent and sale that are energy efficient and cater for people through all stages of life. A large central park area will become the ‘green heart’ of the new community, putting open space and nature within the reach of everyone. Landscaped, tree-lined avenues will link this central space to the Basingstoke Canal tow path to the north and provide attractive routes through the estate that offer additional shared gardens and outdoor space to residents. Pedestrians and cyclists are given priority over cars, with a network of pathways that make finding one’s way around easy. Main vehicle routes are kept to the perimeter of the estate rather than cutting across it. An open square will create a ‘gateway’ to the development, with a new community centre, pre-school nursery, health centre, pharmacy and dentist’s surgery as well as units for shops and restaurants, with space for outdoor dining. Nearby accommodation for elderly residents puts these amenities on their doorstep. Mark Rolt, chief operating officer at developer Thameswey Developments Ltd, said: “Canalside marks an exciting new chapter for Sheerwater, transforming it into a highly desirable place to live that will set a new benchmark for building thriving, sustainable communities. Canalside will comprise several neighbourhoods with distinct identities, offering a range of houses and apartments of different sizes, from one-bedroom studios to five-bedroom houses. The emphasis is on family-sized properties designed to offer flexible accommodation with the potential for adaptation to meet specific needs. Development of the 74-acre (30 hectare) site will take place in phases, to minimise the disruption to existing residents and services. This approach is also taken with open space and other facilities so that there is no loss of public amenities during the development work, which is expected to take at least seven years. The existing primary and secondary schools will be in walking distance of all the new homes and will enjoy shared use of new state-of-the-art sports and leisure facilities with the local community. Work is about to begin on the new leisure complex at Bishop David Brown School in Albert Drive. It includes a leisure centre boasting a 25-metre swimming pool plus a separate teaching pool, sports hall, studios and a gym. The outside facilities include a full-size 3G football pitch, and new grass football and rugby pitches. A dedicated energy centre will provide heat and power to the leisure centre and to the medium rise residential blocks in the central part of the development. Enhanced insulation, low energy lighting, solar panels, ground source heat-pumps and electric car charging points will all help Canalside minimise its environmental impact. Although the overall regeneration scheme already has planning consent issued in 2016, a new planning application reflecting changes and improvements to the scheme made in response to public feedback and additional requirements from the Council has been submitted to the Local Planning Authority. The application is expected to be considered by the planning committee in the autumn although work on the scheme will commence under the existing approval later this summer.